By following a strict programme of regular soil aeration and decompaction treatments, Stuart Yarwood, course manager at Lymm Golf Club in Cheshire, is achieving his goal of maintaining and improving the 18-hole parkland-style course using traditional greenkeeping methods, working in harmony with the weather. Foregoing commonly-used aids such as high fertiliser inputs and programmed irrigation in favour of what he describes as a sustainable approach to greenkeeping, Stuart and his team have produced a golf course that has shown year-on-year improvement since he arrived at the club back in May 2000. The key to this success, says Stuart, is the adoption of course management techniques traditionally found on a seaside links where the greenstaff need to work with the elements rather than trying to combat them. 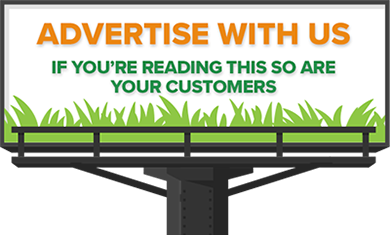 Regular soil aeration plays an important role, with Turfmech's Earthquake Tremor singled out by Stuart for particular praise. "Forgive the pun, but the Earthquake really is a cracking decompaction tool that is benefiting the greens and their approaches, tees and fairways," he commented. "Using rotating wedge-shaped blades, the machine is both fast and very smooth in operation, yet causes minimal surface disturbance which is very important on a busy course such as Lymm. We would not have achieved as much as we have without the help of the Earthquake." Celebrating its centenary in 2007, Lymm Golf Club started life as a nine-hole course that was laid out on thousands of tons of sand spoil excavated during the construction of the Manchester Ship Canal in the late 1800s. A further nine holes were opened in 1974 on lower-lying clay soils, splitting Lymm Golf Club into two distinct halves, described by Stuart as the upper and lower parts of the course. 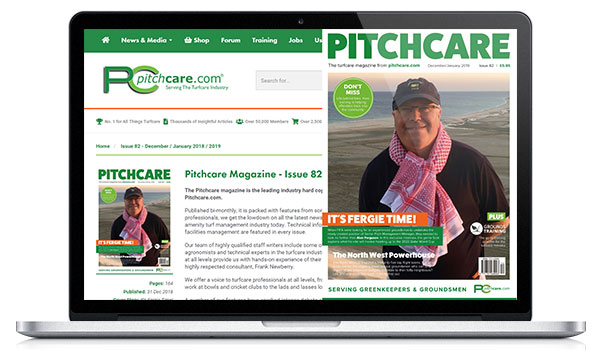 "The quality of the soil across the entire course is not great and both the clay and sand soils do compact quite easily, resulting in poor grass rooting," he pointed out. "Although we have re-built four of the greens to USGA specifications, regular aeration remains essential to maintain the open soil structure and the water and air movement needed to encourage the establishment and growth of better grasses." The arrival of the Earthquake Tremor in September 2003 saw the final element of Stuart's soil aeration strategy put in place. Used every autumn on the 14 non-USGA greens, the Earthquake adds the finishing touch to a greens aeration programme that involves spring and late summer verti-draining to a maximum depth of 400mm, solid tining to 100mm every three to four weeks from March to October and weekly slit tining to a depth of 35mm during the growing season and 200mm for the rest of the year. 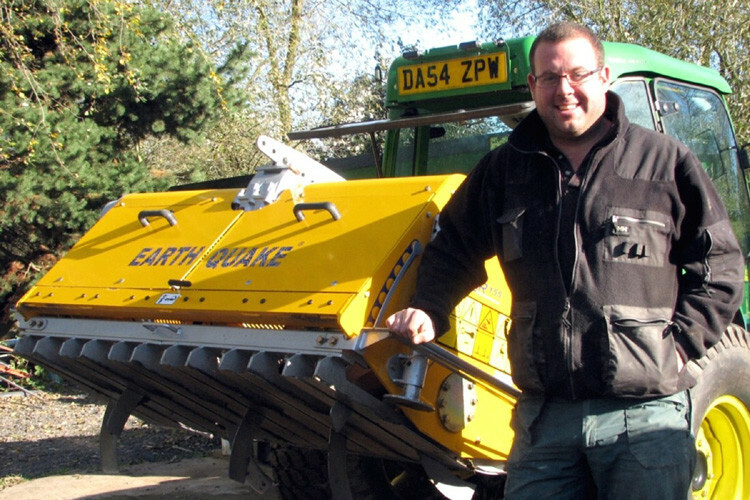 "Working at its maximum depth of around 250mm, the Earthquake programme takes us three days to complete and is complemented by dethatching, solid tining, overseeding and top dressing," explained Stuart. 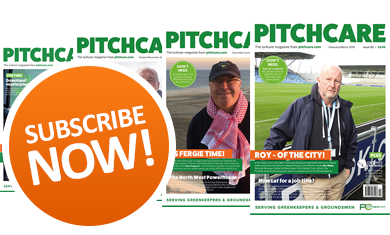 "Three years on, we are seeing the benefits in healthier, better quality and deeper rooting grasses with excellent resistance to drought." 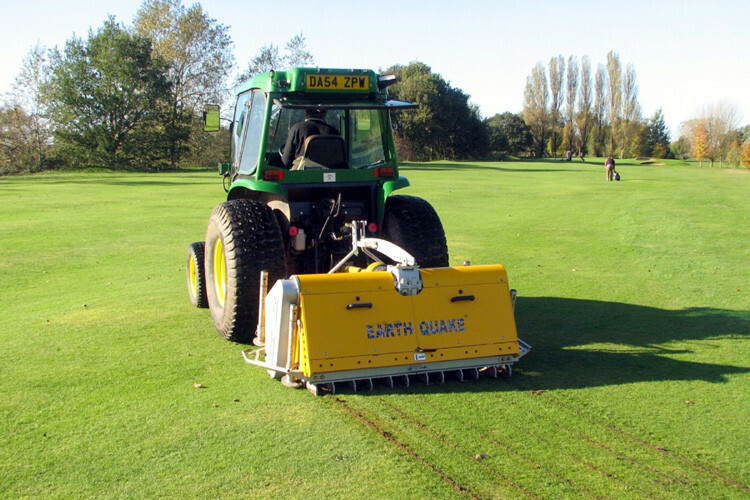 Although the greens are the top priority for Stuart, tees and fairways have benefited also from Earthquake treatments carried out primarily during the winter months when the soil is receptive (not too wet or too dry) and there is no frost. "We have to pick our moments, but the Earthquake's speed of work means that we can decompact a lot of ground in a very short time and leave virtually no trace of where we've been," said Stuart. "Three years on, the machine has nothing to prove. The appearance and condition of the course are testament to its abilities." Lymm Golf Club 1.jpg: Stuart Yarwood, course manager at Lymm Golf Club in Cheshire. Lymm Golf Club 2.jpg: The EarthQuake has been used to decompact the greens at Lymm Golf Club since September 2003. 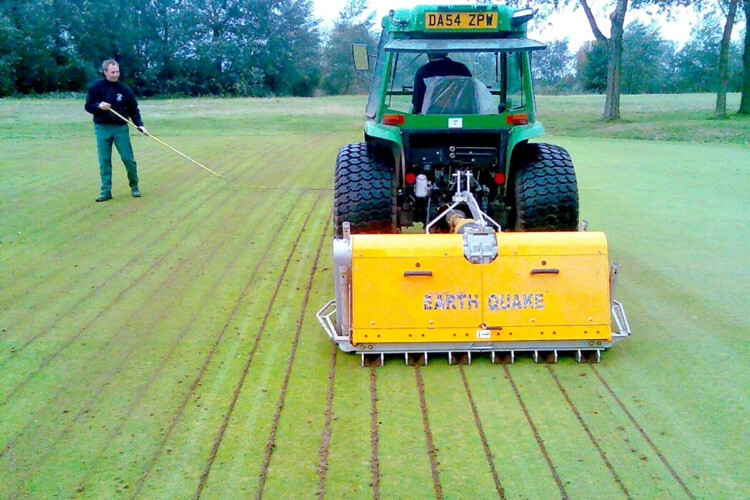 Lymm Golf Club 3.jpg: Decompaction of all fairways takes place over the winter months when the soil is receptive to Earthquake treatments and can fissure to depth.